Popular vote by riding. As this is an FPTP election, seat totals are not determined by popular vote, but instead via results by each riding. Click the map for more details. The 40th British Columbia general election took place on May 14, 2013, to elect the 85 members of the 40th Parliament of British Columbia to the Legislative Assembly in the Canadian province of British Columbia. The British Columbia Liberal Party (BC Liberals) formed the government during the 39th Parliament prior to this general election, initially under the leadership of Premier Gordon Campbell then after his resignation, Christy Clark. 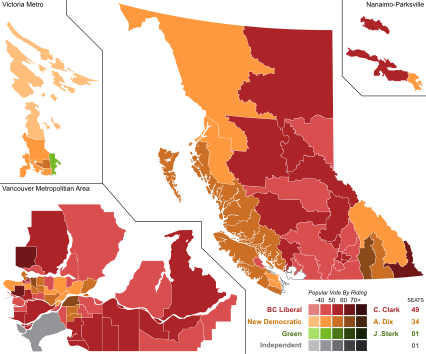 The British Columbia New Democratic Party (BC NDP) under the leadership of Carole James, and then Adrian Dix, formed the Official Opposition. 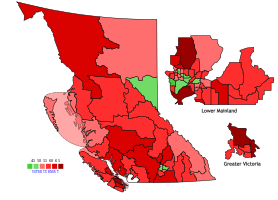 The BC Green Party under the leadership of Jane Sterk and the BC Conservative Party under John Cummins were also included in polling, although neither party had representation at the end of the 39th Parliament. The Liberal Party won its fourth straight majority; Clark was defeated in her riding, but she was re-elected to the legislature in a subsequent by-election in Westside-Kelowna on July 10, 2013, after Liberal MLA Ben Stewart stepped down on her behalf. The NDP remained the official opposition, losing two seats, and the Green Party won its first seat. Despite their victory, the Liberals had been consistently several points behind the opposition New Democrats in every public opinion poll throughout the campaign. Even poll results released on the very last day of the campaign suggested that the New Democrats had an eight to nine percentage point margin over the Liberals. Only one pollster, Forum Research, had released a poll which suggested that the Liberals were close enough that a victory was even possible for them, although even that poll had the New Democrats ahead by two percentage points. The Liberals' upset victory led to significant media debate about the quality of opinion polling in Canadian elections. Section 23 of British Columbia's Constitution Act provides that general elections occur on the second Tuesday in May of the fourth calendar year after the last election. As an election was held on May 12, 2009, the next election was scheduled for May 14, 2013. The same section, though, makes the fixed election date subject to the Lieutenant Governor's right to dissolve the Legislative Assembly as he or she sees fit. The writs were dropped April 16, 2013, and the general election was held on May 14, 2013, with advance voting made available on May 8 through 11. After leading the BC Liberals for 17 years, Gordon Campbell announced he would resign as Premier and party leader in November 2010. This was seen as the result of opposition to the Harmonized Sales Tax, which was very unpopular with voters. In the ensuing leadership campaign, Christy Clark, the eventual winner, suggested she would prefer to hold an election earlier than 2013 to secure her own mandate. She was believed to be preparing her party for an election as early as autumn 2011. However, due to the unfavourable result from the HST referendum, she decided to rule out an early election. British Columbia Liberal Party Christy Clark $11,740,241 The BC Liberals have formed a majority government since May 2001. With the resignation of party leader Gordon Campbell, the new party leader Christy Clark was selected on February 26, 2011. The party claims it is independent of the federal Liberals and the federal Conservatives. British Columbia New Democratic Party Adrian Dix $9,090,489 Affiliated with the federal NDP, the BC NDP held power from 1972-1975 and 1991-2001. On April 17, 2011, Adrian Dix was chosen as the party leader in their 2011 leadership convention. Green Party of British Columbia Jane Sterk $177,660 The party is based on the belief in sustainability and maintains a full policy platform. British Columbia Conservative Party John Cummins $154,502 Having last won a seat in 1978, the Conservative Party has re-emerged as minor party. According to polling in March 2013, the party holds less than one-third of the centre-right vote (shared with the BC Liberals). The party received a temporary boost when, on March 26, 2012, Abbotsford South MLA John van Dongen announced that he was leaving the BC Liberals to join the BC Conservatives, providing the party with its first representative in decades. Van Dongen shortly quit the party to sit as an independent on September 22, 2012. Advocational International Democratic Party of British Columbia Michael Yawney $2,780 The party was registered in 2006 and despite accumulating over two million dollars in assets the party did not nominate any candidates in the 2009 election. British Columbia Party $0 A right-of-centre party which did not nominate any candidates in the last election and only 2 candidates in the 2005 election. Christian Heritage Party of British Columbia Wilfred Hanni $2,111 The party is based in the supremacy of God and rule of law and maintains a full policy platform. It was founded in 2010 as the BC Heritage Party but changed its named to the Christian Heritage Party in 2012 when it developed ties to the federal Christian Heritage Party. Communist Party of British Columbia Samuel Hammond $1,375 As a provincial branch of the federal Communist Party of Canada, party advocates a communist ideology, including labour rights and limits to corporate control. Active since 2001, the party nominated four candidates in 2001 and three in both the 2005 and 2009 elections. British Columbia Excalibur Party Michael Halliday $901 Founded in 2013, the party has developed an election platform. BC First Party Salvatore Vetro $1,768 Founded in 2010, the party advocates for democratic reforms, including the use of referendums, free votes, and at-large elections for the position of Premier. The party nominated a candidate in the 2011 by-election. Helping Hand Party Alan Saldanha Founded in 2011. The party is based on the belief "that helping others unconditionally provides for a meaningful existence" and intends to run only a single candidate, Alan Saldanha in Surrey-Newton. British Columbia Libertarian Party $1,994 The party advocates for libertarian principles including protecting civil liberties and private property rights, legalizing drugs, and ending government controls on economic activity. Active since the 1980s, the party nominated six candidates in both the 2005 and 2009 elections. British Columbia Marijuana Party Marc Emery $751 The party seeks to legalize marijuana. Active since 2000, the party nominated a full slate of candidates in 2001 and 44 candidates in 2005. The party endorsed the Green Party in the 2009 election but nominated one candidate regardless. Platinum Party of Employers Who Think and Act to Increase Awareness Espavo Sozo $0 Founded in 2005, the party advocates for government accountability. The party nominated 11 candidates in the 2005 election but none in 2009. British Columbia Social Credit Party The once dominant conservative party last formed the government under Bill Vander Zalm and Rita Johnston but has not elected an MLA since 1991. The party did not nominate any candidates in the 2009 election. Unparty: The Consensus-Building Party Michael Donovan $0 Founded in 2011, the party promotes consensus government over adversarial party politics. B.C. Vision Jagmohan Bhandari $179 Founded in 2013, the party has developed an election platform that includes technology development, environmental conservation, public health, cross-generational communication, senior education, and fiscal responsibility. Work Less Party of British Columbia Conrad Schmidt $9,420 The party seeks to legislate a 32-hour or four-day work week. Active since 2003, the party nominated 11 candidate in 2005 and two in 2009. Your Political Party of British Columbia James Filippelli $1,884 The party seeks to reduce the influence of political parties on government and increase public review of government operations, inclusive of crown corporations and local governments. They maintain a full platform which includes making all campaign promises legally binding. Active since 2002, the party nominated one candidate in 2005 and two in 2009. Voter turnout was 57.1%, but varied from riding to riding. 10 of the 85 ridings had less than 50% voter turnout. Richmond and Kelowna were the only major cities with under 50% turnout. The following is a list of candidates, as shown on the list of candidates that have officially registered as noted by Elections BC's List of Standing Nominees[permanent dead link] for more details. Names in bold indicate party leaders and cabinet ministers. The victorious Member of the Legislative Assembly (MLA) for each district has a coloured bar to the left of his or her name. ^ "B.C. Voter Participation: 1983 to 2013" (PDF). Elections BC. Retrieved May 11, 2017. ^ "B.C.’s Premier Christy Clark wins byelection, returns to legislature". Toronto Star, July 10, 2013. ^ "Ben Stewart steps aside in Kelowna for B.C. Premier Christy Clark". Vancouver Sun, June 5, 2013. ^ "Why were polls so wrong about the B.C. election?". CBC News, May 15, 2013. ^ a b "Why were the polls completely wrong about the B.C. election?". The Globe and Mail, May 15, 2013. ^ a b Constitution Act, s. 23. ^ Mcmanus, Theresa (April 17, 2013). "Writ dropped, the race is on". The Record. Retrieved April 22, 2013. ^ "Important Dates". Elections BC. Retrieved April 22, 2013. ^ "Campbell's stunning resignation leaves fate of party, HST up in the air". Globe and Mail. Toronto. November 4, 2010. Retrieved May 19, 2011. ^ "Clark needs time as premier before renewing mandate". Vancouver Sun. March 1, 2011. Archived from the original on December 22, 2015. Retrieved May 19, 2011. ^ "Clark may be too election ready". Vancouver Sun. May 16, 2011. Archived from the original on December 22, 2015. Retrieved December 21, 2015. ^ "Christy Clark rules out fall B.C. election". CBC News. August 31, 2011. Retrieved August 31, 2011. ^ "Political Parties" (PDF). Elections BC. Retrieved May 1, 2013. ^ "Financial Reports and Political Contributions". Elections BC. Archived from the original on 2012-05-10. Retrieved April 6, 2016. requires navigation to political party. ^ "10 Core Principles". Green Party of British Columbia. Retrieved March 25, 2013. ^ "Green Book 2013". Green Party of British Columbia. Retrieved March 25, 2013. ^ "Annual Financial Report" (PDF). Elections BC. 2009. Retrieved March 17, 2013. ^ "B.C. Party looking to offer alternative to the Liberals". Alaska Highway News. Fort St. John, B.C. January 7, 2004. p. 3. ^ "Mission Statement and Statement of Principles". Christian Heritage Party of British Columbia. Archived from the original on February 13, 2013. Retrieved March 25, 2013. ^ "Party Policies". Christian Heritage Party of British Columbia. Archived from the original on February 18, 2013. Retrieved March 17, 2013. ^ "Party Program". Communist Party of British Columbia. Archived from the original on 2013-04-10. Retrieved March 25, 2013. ^ "Party Ideals". British Columbia Excalibur Party. Retrieved March 18, 2013. ^ "Our Principles". BC First Party. 2013. Retrieved March 25, 2013. ^ Saldanha, Alan (March 25, 2013). "Helping Hand Party believes in assisting British Columbians in need". The Georgia Straight. Retrieved March 25, 2013. ^ "Home". British Columbia Libertarian Party. Retrieved March 17, 2013. ^ "Home". Platinum Party of Employers Who Think and Act to Increase Awareness. Retrieved March 25, 2013. ^ "A Concise History of the British Columbia Social Credit Party". British Columbia Social Credit Party. Archived from the original on May 8, 2013. Retrieved March 25, 2013. ^ "What is unparty?". Unparty: The Consensus-Building Party. October 8, 2012. Archived from the original on 2013-01-12. Retrieved March 25, 2013. ^ "Election Platform". BC Vision. Retrieved April 9, 2013. ^ "Introduction". Work Less Party of British Columbia. Archived from the original on April 16, 2013. Retrieved March 17, 2013. ^ "Platform". Your Political Party of British Columbia. Retrieved March 17, 2013. ^ "2013 General Election Final Voting Results". Elections BC. Archived from the original on 2013-09-30. Retrieved May 29, 2013. ^ a b c "George Abbott, John Les and Mary McNeil add their names to B.C. Liberal resignations". Vancouver Sun. August 31, 2012. Retrieved December 21, 2015. ^ "Penticton MLA Bill Barisoff stepping down". CBC News. August 20, 2012. Retrieved September 4, 2012. ^ "B.C. minister Pat Bell's health forces him to quit politics". CBC News. February 17, 2013. Retrieved August 29, 2015. ^ "Bloy quits B.C. cabinet over e-mail leak, will not run again". Burnaby News Leader. March 15, 2012. Archived from the original on December 22, 2015. Retrieved December 21, 2015. ^ "Ron Cantelon Retires: BC Liberal MLA Not Seeking Re-Election". Huffington Post. December 10, 2012. Retrieved December 12, 2012. ^ "Another B.C. Liberal quits politics". CBC News. July 11, 2012. Retrieved September 4, 2012. ^ "B.C. finance minister steps down from cabinet". CBC News. August 29, 2012. Retrieved September 4, 2012. ^ "B.C. Liberal Colin Hansen not running in next election". CBC News. September 21, 2012. Retrieved September 21, 2012. ^ a b c "Confirmed Candidates in the 2013 British Columbia Election". BC Election 2013. Archived from the original on January 5, 2013. Retrieved December 12, 2012. ^ "B.C. Liberal MLA Dave Hayer won't seek re-election". The Province. July 9, 2012. Archived from the original on July 12, 2012. Retrieved September 4, 2012. ^ "Another Liberal MLA not running in 2013". News 1130. June 30, 2012. Archived from the original on July 3, 2012. Retrieved September 4, 2012. ^ a b c "B.C. cabinet minister, 2 other MLAs to call it quits". CBC News. September 4, 2012. Retrieved September 4, 2012. ^ "Kevin Krueger not running in next election". News 1130. June 27, 2012. Archived from the original on September 3, 2012. Retrieved September 4, 2012. ^ "New Westminster MLA Dawn Black to retire from politics". New West News Leader. August 3, 2011. Archived from the original on December 22, 2015. Retrieved December 21, 2015. ^ "Provincial Politics: NDP's Michael Sather Not Running Next Election". Langley Today. July 30, 2011. Retrieved September 4, 2012. ^ Oliver, Cassidy (January 21, 2013). "MLA Slater won't run again". The Province. Archived from the original on January 24, 2013. Retrieved January 21, 2013. ^ a b c d e f g h i j k l m n o p q r s t u v w x y z aa ab "Candidates by Riding". Green Party of BC. Retrieved February 18, 2013. ^ "John Cummins to run in Langley riding". Langley Times. January 7, 2013. Retrieved February 18, 2013. This page was last edited on 17 April 2019, at 02:28 (UTC).